2014 Upper Deck Goodwin Champions is due in Wednesday at Sports Cards Plus about 3:00 via FedEx. For ONLY $75, every every 20 pack box provides 100 cards which include at total of 3 Autographs, Memorabilia, Manufactured Patches, 1of 1 Original Artworks, or Museum Relics. Falling an average of 1 per box, all autographs come with on-card signatures. Autographs include Michael Jordan, Tiger Woods, Lebron James, Wayne Gretzky, John Elway, Joe Montana, Dan Marino, Bo Jackson, Peyton Manning, Tony Gwynn, Rory Mcllroy, Jerry Rice, Ken Griffey Jr. Mark McGwire, Canelo Alvarez, Mario Lemieux, Lindsey Vonn, Canelo Alvarez, and Oscar De La Hoya. Brandon has opened a few boxes of 2011 Panini Prime Cuts Baseball. Why? Because he keeps pulling all kinds of SUPER HITS. Here is Brandon with his 1/1 Derek Jeter Bat Barrel card and Harmon Killebrew Autographed Jersey Patch 1/1. Here is Brandon with his Jackie Robinson Timelines Triple Jersey Patch 1/1 and George Brett Autographed Bat Book 1/5. Brandon has only been a Sports Cards Plus customer for a few weeks, but he is a quick learner. 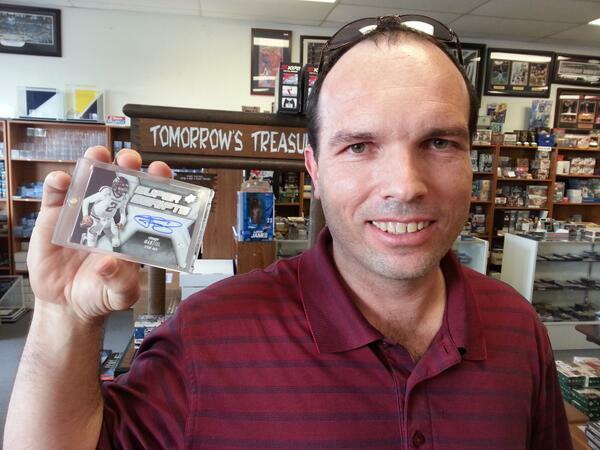 Brandon knows The BEST CASES in the Hobby are at Sports Cards Plus. Scott is a Super Hit Factory regular. Why because he regularly pulls Super Hits like this 2014 Upper Deck SPx Johnny Manziel Super Scripts. 2014 Bowman Football arrived last Wednesday and of course we had a couple of Johnny Manziel Super Hits pulled on the first day. Here is Adam with his Johnny Manziel Autographed RED Refractor #d/25. Brandon is a baseball collector, but when he saw all the great hits pulled from our cases of 2014 Bowman Football, he had to give it a try. Here his Brandon with his Johnny Autographed Mini RC #d/99! Also arriving last Wednesday was 2013-14 Contenders Hockey. As always, Sports Cards Plus cases are loaded. 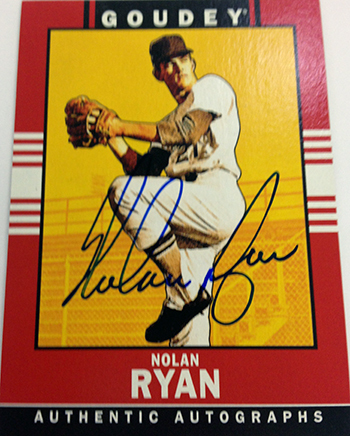 Customers consistently pulled eight autographs per box. Here is Chris with his 1/1 Auto RC and two quad autos. Don't worry, we loaded up on 2013-14 Contenders Hockey. Come on in and pick your box from The BEST CASES in The Hobby. Also arriving last Wednesday was 2014 SPx Football. You already saw Scott's Manziel. Here is Jay with his Jerry Rice Gold Auto Jersey #d/10. Everyone is catching World Cup Soccer Fever and Panini Prizm 2014 World Cup Soccer cards are the cure! Here is Wiley with his dose of Ronaldo Autograph! Bryce and his dad pulled a Ronaldo Auto the previous Saturday at The Super Hit Factory. Before their move to Virginia, dad stopped in for one more box of 2014 Panini Prizm World Cup Soccer and The Super Hit Factory delivered this Lionel Messi Autograph. Good Luck to Jereme, Bryce and family. Stop in The Super Hit Factory to say hi whenever you visit San Antonio. So, what are you waiting for? Don't be the guy who says, "That could have been my picture." Come to Sports Cards Plus TODAY and pull your Super Hit. And, while your here, enter our contests for over $500.00 at Sports Cards Plus.